It might seem as if nothing has been happening in Caton, but after fourteen months of negotiation, Lancashire County Council have finally agreed for our cabinet to be sited at Caton Community Primary School. B4RN have therefore begun detailed planning of the network and we now need to get cracking with fundraising and further wayleaves for the core route. There have also been developments in government policy that means B4RN can obtain some central funding for the installation work. A new B4RN Caton Leaflet explains this and the need for everyone interested to register on a new B4RN website. It doesn’t matter if you have previously registered your interest or signed up for mailing lists, you still need to register again to allow B4RN to include you in the GBVS application. Regular meetings are still being held on the second Monday of every month at 8:00pm in the Station Hotel. Come along and say hello! Keep tuned for more information. 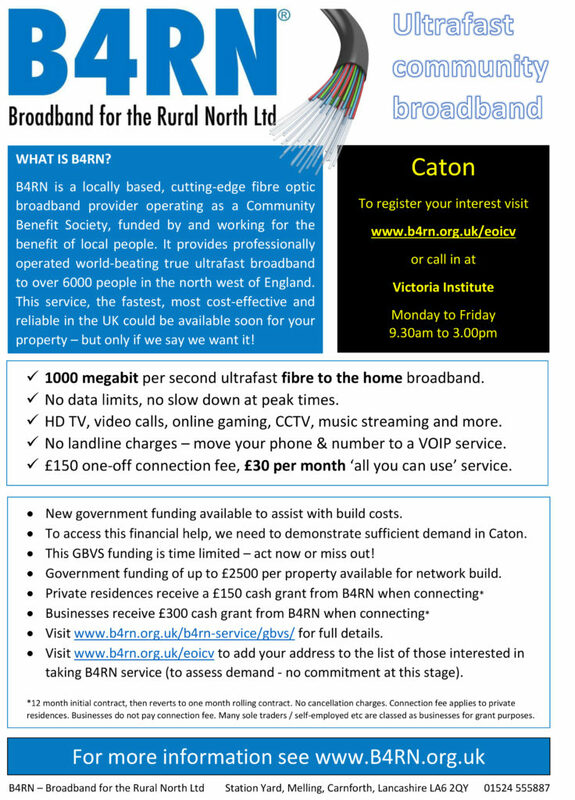 Better still, register your interest so B4RN can understand the demand in Caton and we can keep you up to date. This website is run by local volunteers in order to promote and bring the B4RN service to the parish of Caton-with-Littledale.